A(***)Pre-Trigger Cables - Why You Want / Need This? When you want to remotely fire a camera using any radio or other wireless setup, these cables will connect the receiver device to the camera itself. Most electronic cameras use a 3 wire shutter system, using a dual position shutter switch, such that the first position (half press) will wake up the camera, turn on the meter, and sometimes focus, and then the full press will actually fire the shutter. The Override Switch in the ON position will have the effect of keeping the camera in this half pressed "ready state", so it will be instantly ready to snap the picture once the trigger signal is received. The cable can be wired without this Override Switch in either the Pre-Trigger ON or the Pre-Trigger OFF position, depending on your needs. During the remote camera setup, the Override Switch needs to be in the OFF position, or the cable must be unplugged each time to review the image and adjust the camera settings. 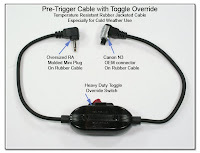 Click for more on the Basic Operation for all Pre-Trigger Cables. 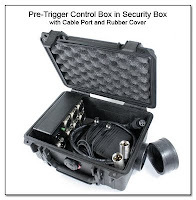 This 1 x 6 Pre-Trigger Box works just like my other Multiple Output Pre-Trigger Boxes, but this unit is designed and set up for heavy duty weather resistant SuperFlex cables and connectors. These connectors and other parts can be seen in the next image, and the entire setup (without the extension cables) is made to fit into a heavy plastic security box as seen here. Each of the 6 outputs are electrically isolated from each other to prevent the possiblility of "shutter bounce" where the firing of one camera will then re-fire the next connected camera. This setup has already been tested to successufully fire multiple cameras at a wired distance of over 800 feet using these water resistant SuperFlex cables equipped with the Heavy Duty Weatherproof XLR connectors. 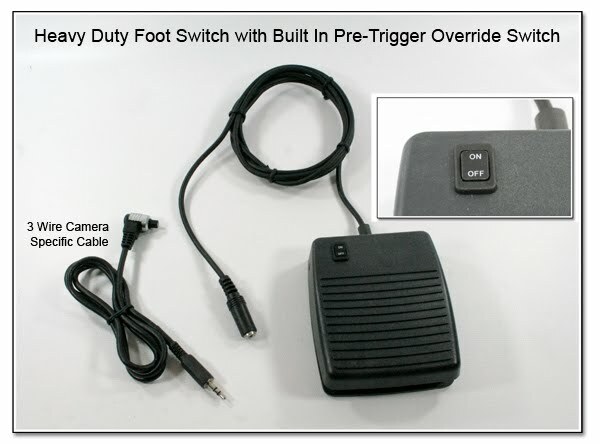 A foot switch is shown as the trigger (based on the customers desires), but any momentary switch can be used, even a radio setup can be plugged into the mini jack input in the Pre-Trigger Control Box. This setup can even be triggered directly from the handheld camera, should it be desired to have all the cameras (handheld and remote) to fire at the same time. Why is this done this way? This setup was requested for use outdoors in a soccer stadium where the increased amount of electronic equipment (television and advertising signs) have been running havoc with the photogs radio remotes, giving unreliable firing. The photog wanted to have 2 remote cameras in each goal, and for all of the remotes to be triggered with a single press of the momentary switch (so as not to miss any of the action by pressing the wrong side of a dual switch). All the cable connections are positive locking, weatherproof, and the cable itself has a thick neoprene jacket for durability from trampling, and flexibility under all weather conditions. If you are interested in this level of hardwired quality, contact me with your needs and setup for a custom design and quote. 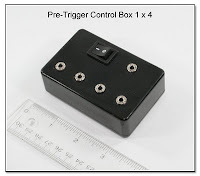 For other multi-output Pre-Trigger Control Boxes see this the items here (end of section). 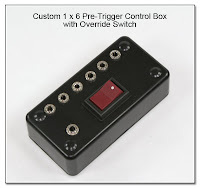 The Custom Pre-Trigger Control Box itself is priced as a basic unit with one output for $345 and then $85 for each additional output connection. As shown in this posting, this unit would be $345 + ($85 x 5) = $770. Other components needed at additional costs are the Y-Splitter, short and long extension cables, cables to connect directly to the cameras, and a foot switch or other trigger switch. 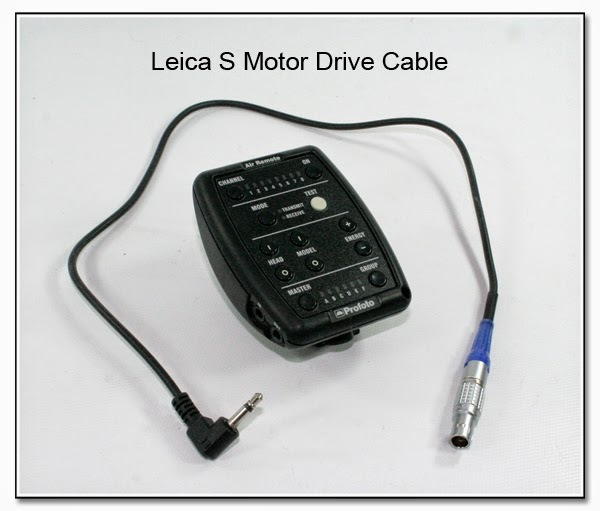 The Y-Splitter Cable has similar included electronics to the Control Box, and is $295, while the camera end connectors are $175 each. Extension cables are priced as a connector charge of $95, and then a wire charge of $2 /foot. A 25 foot (minimum length) positive locking, weatherproof extension would then be $95 + ($2 x 25) = $145. 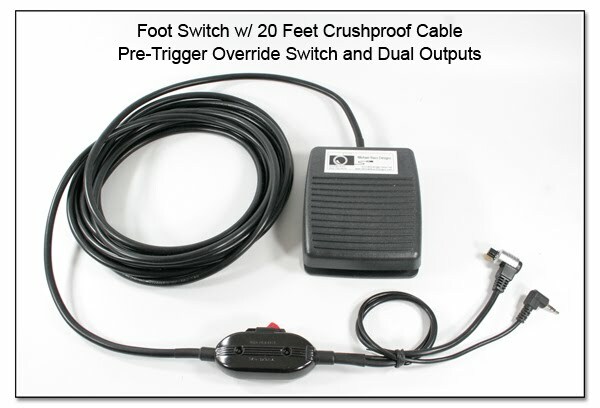 The foot switch with the heavy duty cable and connector is $175, while the rigid Pelican case with the wire pass through port is $195. Not shown as part of this original setup is a heavy duty winder reel to hold the approximately 800 feet of cable. With the cable spooled on the winder, this item is $295. This winder reel is available in different sizes as needed. Under Camera Mounting): Control Box w/ Disconnect. 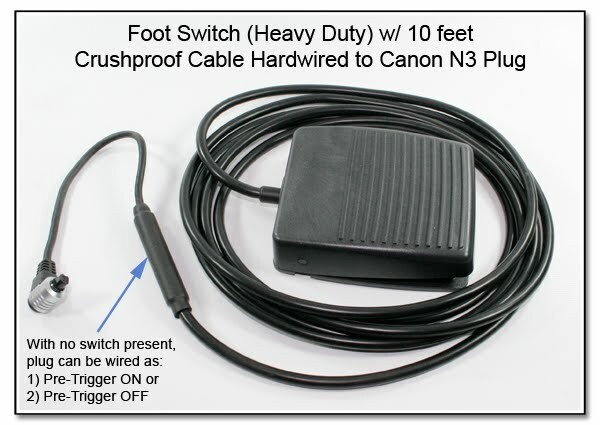 While a foot switch is USUALLY made as just a single momentary position (and hence the need for the Override switch), this style of foot switch can also be made as a 2 position press, just like the camera shutter button, or any of the hand controllers (Nikon MC-30, Canon RS-80N3, etc). This requires both an additional micro switch inside the foot switch, and a different multi-conductor cable to the camera plug, as well as some additional costs. Do keep in mind, that the foot is just not as sensitive as the hand, which is why this is not that common a setup. If this is really what you want, ask! 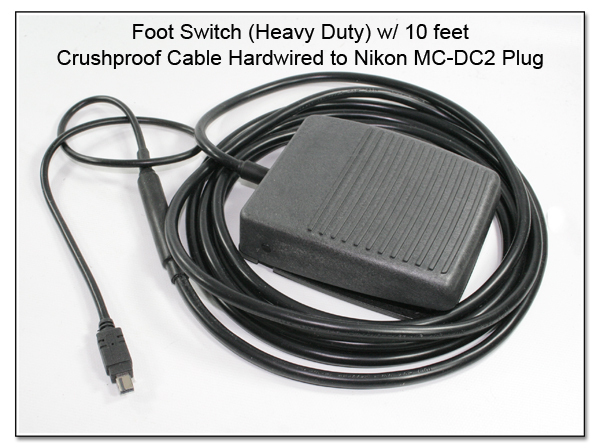 This same Foot Switch is also available in an Extra Heavy Duty Metal version (black only) for an additional $45, and while the normal Foot Switch alone weighs in at 3.5 oz, the metal version is a heafty 2.5 pounds. 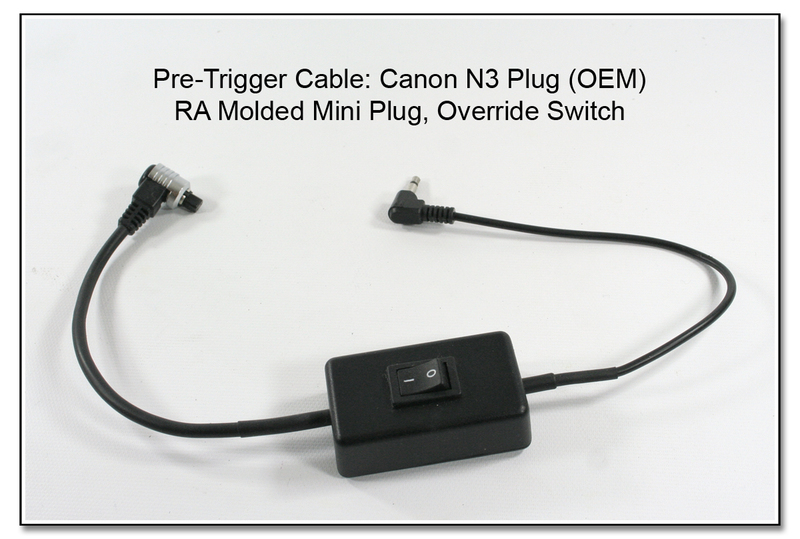 This Pre-Trigger Cable has the Canon N3 connector (OEM version), a RA mini plug, and an easy to use small override switch. The cable lengths can customized up to 30 inches for the same price, and it is $130 as shown. When this Pre-Trigger Cable is made using a generic camera connector, and a straight mini plug, it is now specially priced at $45, and the cord lengths can still be customized to your needs. This Pre-Trigger Cable has the MC-DC2 connector, which is used for the Nikon D90 and D7000 cameras (and possibly others). The price for this setup is also $130 as shown. 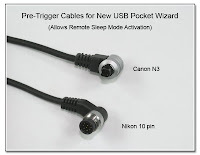 These Special Pre-Trigger Cables - USB MultiMax Version are $65 each using one of the generic camera connectors shown (Nikon 10 pin or D80, Canon N3 or XT). They DO NOT need the override switch, as it is built into the new PW MultiMax unit. This item will allow a remote enable or disable of the pre-release action, similar to what the manual override switch would do. The cable length is about 16 inches long, but like all my other custom items, this can be varied to suit your needs. Up to 24 inches total length would be the same price, while much longer cables are possible by quote. 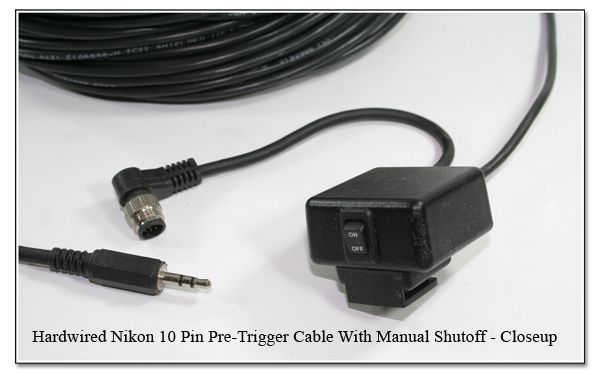 For a limited time (for this cable only), a Nikon 10 pin or the D80 OEM plug is available instead of the generic connector for an additional $25, while a Canon N3 OEM plug is available for $35. 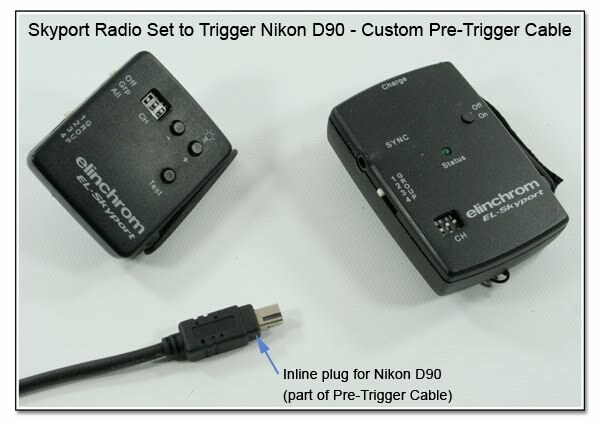 The Nikon D90 is using a different connector, is brand new, hard to find, and is currently $45. (The amount of the OEM connector needs to be added to the cost of the cable.) These Canon and Nikon OEM connector plugs are shown in the image to the left. Using this Special Pre-Trigger cable along with a USB MultiMax PW as the receiver, will allow you to remotely wake up or allow to sleep the remote location camera (enable or disable the pre-trigger mode). This means that any remote camera set in the rafters, or other hard to access location can be set up hours or days before the event, left alone to go into sleep mode based on the camera delay settings, and then remotely turned on from the transmitter PW just minutes before shooting time without having to leave the camera in the pre-release ready state (half shuter press) consuming battery power. This is a relatively new function of the USB model of the MultiMax Pocket Wizard and was recently reviewed by Rob Galbraith on January 19, 2008. Click here to see Rob's review open in a new window. There seems to be a quirk when trying to use the Skyport Radio Set to trigger a camera, especially the popular Nikon D90. A normally constructed Pre-Trigger or Motor Drive cable will give inconsistent camera triggering. 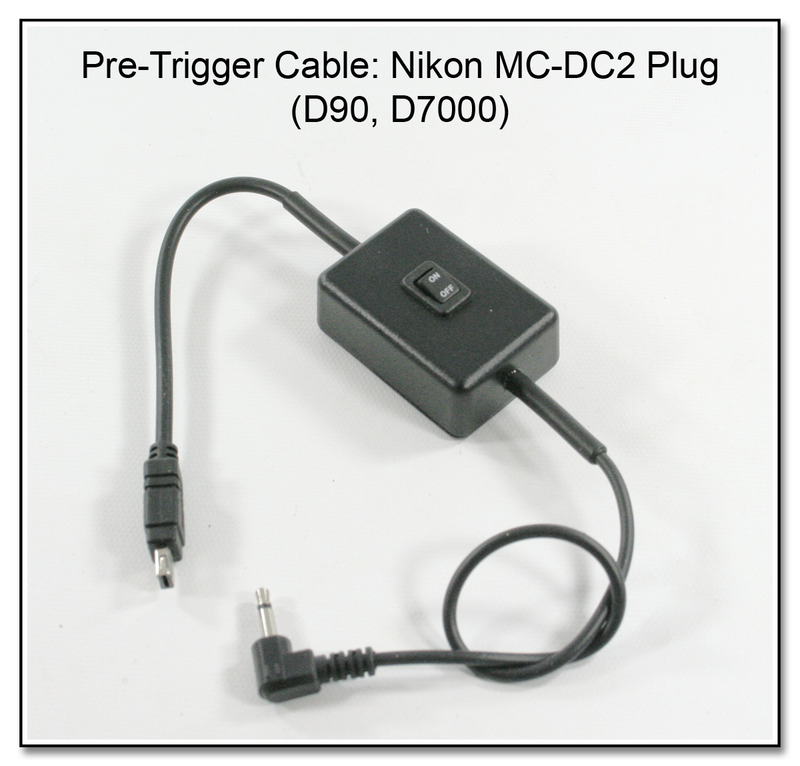 A Customized Pre-Trigger Cable, ending in the D90 connector shown in the image is needed for reliable camera triggering, and will cost $130. 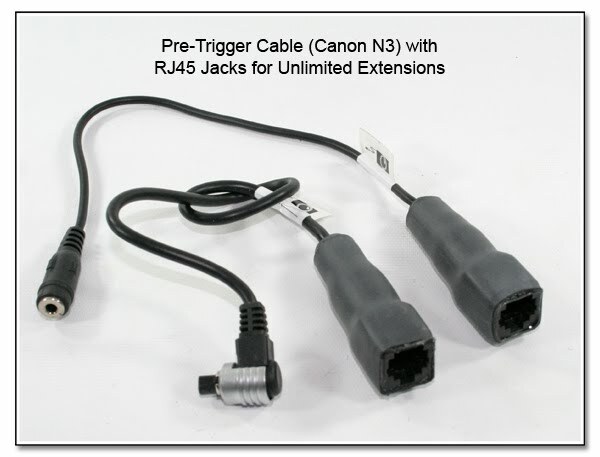 This Customized Pre-Trigger Cable has currently been tested for the Canon Rebel series, and the Canon 5D as well. It is likely that each camera must be tested to determine the correct Pre-Trigger cable configuration and internal electronics. Important: Due to the poor design of the D80 and D90 camera connector, they stick straight out from the camera, as opposed to all the other connectors which are RA (right angle) connectors. This puts a large torque force on the plug and the camera jack, and many have had to be repaired. I offer a Re-Molding mod for these inline connectors to convert them from a straight inline connector to a RA connector, usually forward, as seen here. If you should break the straight connector, it is not returnable. This applies to all uses of the D80 or D90 straight connector. 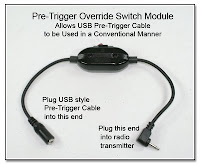 This USB Pre-Trigger Cable will NOT work correctly if plugged into either of the upper ports of the PW (or other radio receiver), unless the Pre-Trigger Override Switch Module (below) is first attached to the USB Pre-Trigger Cable. This conversion module is currently being offerred at a special price of $105. When one of my new USB Pre-Trigger Cables is plugged into the mini jack side of this conversion module, the combined unit then behaves just as a normal Pre-trigger Cable with the Override switch. You must specify whether this is to be used for Canon or Nikon. It can also be made with a selector switch so this unit can be used with either brand (additional $40). 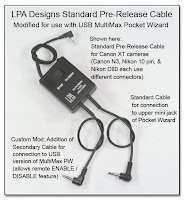 Here is a Custom Mod for the LPA Designs Pre-Release Cable which will allow the Standard LPA Designs Pre-Release Cable (Canon XT version pictured) to be used with the new USB version MultiMax PW as well as with a conventional PW. See above for details of the Special Pre-Trigger Cables - USB Version. 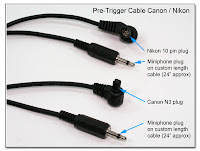 It is $50 for this custom mod to add the extra 3 conductor cable into the existing Pre-Release Cable for the Canon XT model (shown), or the Canon N3, Nikon 10 pin, or Nikon D80 models (not shown). When used for remote ENABLE / DISABLE of the pre-release (pre-trigger) action, the manual switch needs to stay in the OFF position, since it is the receiver PW that controls this action being remotely activated from the transmitter PW. This is most useful when the remote camera has to be set up hours or days in advance of the shoot. The camera can be left to go to sleep and conserve battery power, and then woAؿRup and sent into the pre-release (pre-trigger) mode on a moments notice, ready to shoot with just about a full battery charge. 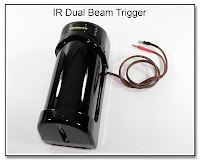 This Custom Mod just appeared in Rob Galbraith - Digital Photography Insights on 3-31-08. Click here to see Rob's story open in a new window. Pre-Trigger Cables without the override switch are $60 using the generic camera connector. These are also referred to by the older name of "Motor Drive Cables" left over from when cameras actually had motor drives. OEM Canon N3 and Nikon 10 pin connectors are available for an additional $45. The length is usually about 16 inches, but can be customized to any length up to about 30 inches for the same price. This items are usually wired to keep the camera AWAKE, just as if you had the shutter half pressed all the time, but it can also be wired to allow the camera to go to SLEEP if you specify this is what you wish. Normally these Motor Drive cables will end in a mini plug, but a HH connector can also be used for just $5 additional. If you are using the "Add-A Tap" setup with zip cords, be sure to specify that you need UNPOLARIZED HH plugs which have both blades of the same width. This form of the Pre-Trigger Cable uses the very common RJ45 connector, and standard ethernet cables (Cat5, 5e, or 6) as extension cords to make the remote as long as desired. This current setup was requested to end in the mini jack for the greatest flexibility, so any number of different trigger switches can be attached as needed. The N3 to RJ45 jack cable is $130, and the other end cable as mini jack to RJ45 jack is $55. As shown, this is for the 2 wire setup, wired as pre-trigger ON. If you are thinking you might want to use a 2 position hand switch as well (RS-60E3, or RS-80N3 modified to end in a mini plug) so you can have the half press as well as the full press (Pre-Trigger ON or OFF) along the entire distance, then a 3 wire setup is needed, as well as an Override Switch ($55) to switch between the 2 modes of operation. This is possible since there will be unused conductors within the ethernet cable and end connectors, and then within the standard ethernet cables. The Pre-Trigger Cable with the Override switch is $70 using the larger TOGGLE switch (left), and $80 using the MINI switch (right). The length is usually about 6 to 8 inches on either side of the override switch, and can be customized when ordered. Add $5 to use a RA mini plug instead of the straight mini plug. OEM Canon N3 and Nikon 10 pin connectors are available for an additional $45. The TOGGLE override switch is easier to manipulate, and has a more tactile feel, and is easier to see the position of the switch. 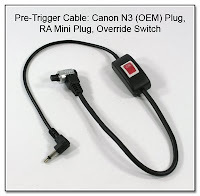 This Cold Weather Pre-Trigger Cable with the Toggle Override Switch, Nikon 10 pin OEM connector, and Oversized RA Molded Mini Plug, all on Temperature Resistant Rubber Jacketed Cable is being sold for a SPECIAL price of $130, while it would normally sell for $145. The oversized mini plug is easy to grip, and the heavy rubber cables should stay flexible when used outdoors in the cold weather. (Sorry, but the Canon N3 connector is not available at this price.) During cold weather, if you have trouble gripping, and turning the locking collar of the 10 pin connector, see the Custom Aux Collar, (below), which increases the diameter of the connector, and makes it easier to turn. This Cold Weather Pre-Trigger Cable with the Toggle Override Switch, Canon N3 OEM connector, and Oversized RA Molded Mini Plug, all on Temperature Resistant Rubber Jacketed Cable is being sold for a SPECIAL price of $140. The oversized mini plug is easy to grip, and the heavy rubber cables should stay flexible when used outdoors in the cold weather. This Pre-Trigger Combo Unit is a specialized version of the hand trigger controller where the override switch and mini plug are incorporated directly into the controller. It is shown with the molded straight mini plug for $175, although the RA mini plug can be added for an additional $5. As with the other Pre-Trigger units, the OEM Canon N3 and Nikon 10 pin connectors are available for an additional $25 and $35, respectivly. 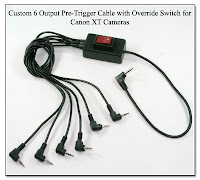 Here is a Custom 6 Output Pre-Trigger Cable with the Override Switch hardwired for a series of Canon XT cameras. The costs for this and the other control boxes below are $185 for the basic unit (one output) and then $55 for each additional output (cable or jack as below). The 6 output unit shown here for the XT series would be $460. All the outputs are isolated from each other to minimize feedback and interference. Other camera connectors (Canon N3, Nikon 10 pin, Nikon D80) are charged at $35. The Manual PushButton will add $45, and each Threaded Insert / Mounting Foot adds $45. For certain setups, the threaded insert can be made as a pass through so the Control Box can be mounted to the camera bottom, and then a reduced neck thumbscrew would be $25. A second Input Jack (2 or 3 wire) will add $70, while the 3 position Disconnect / Input Selector Switch will add $75. 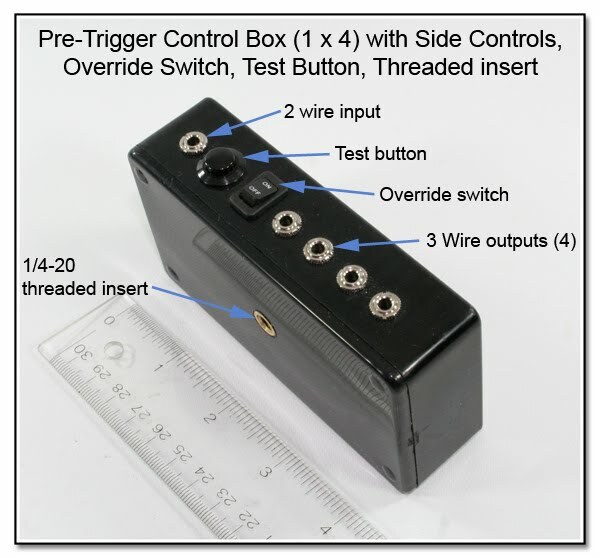 This Custom 1 x 6 Pre-Trigger Control Box (left) with the Override Switch can accept different input and output connections. 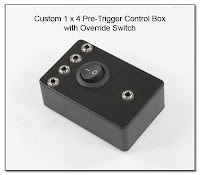 The Custom 1 x 4 Pre-Trigger Control Box (below) with the Override Switch can also accept different input and output connections. Each output jack of both units is 3 conductor wired and diode protected to prevent trigger bounce. This means you can use either conventional "Pre-Trigger Cables", "Motor Drive Cables" or the Special Pre-Trigger Cables - MultiMax Version, with any conventional radio receiver. When the oversized RA mini plugs are used, as in the Cold Weather Pre-Trigger Cable (Canon), or (Nikon), additional spacing is needed between the mini jacks on the Control Box. 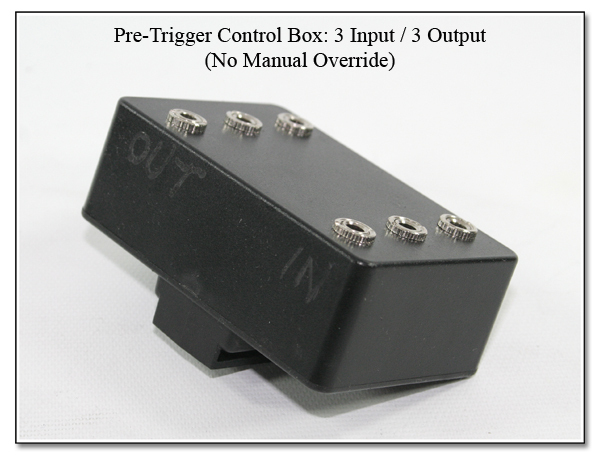 The Override switch on the Control Box face will set the Pre-Trigger function of the output when the Special Pre-Trigger Cables - MultiMax Version are used. This allows for a clean setup in that the Control Box should be at your main location, and then separate lines run out to the remote cameras. The Control Box switch will then set the Pre-Trigger action for all the output cameras at the same time. If a standard Pre-Trigger Cable is used for any output, then the individual switch on that cable will control the Pre-Trigger action for that camera. 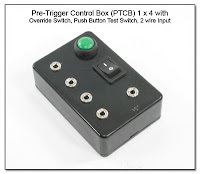 This PTCB, is also a 1 input, 4 output (1x4) Pre-Trigger Control Box (PTCB) with the Override (Pre-Trigger) switch, but you can also see the Push Button Test Switch (green) which adds just $45 to the total. The single input as shown is a 2 wire input, but an additional 3 wire input can also be added if desired for true half press and full press trigger action. As with all the other PTCB's, many types of inputs can be used, from the Lens Mounted Trigers, Foot Swtich, Manual Tripper, radio receiver, or even the handheld camera. Pricing for these Pre-Trigger Control Boxes is the same as the 1 x 6 Pre-Trigger Cable just above. 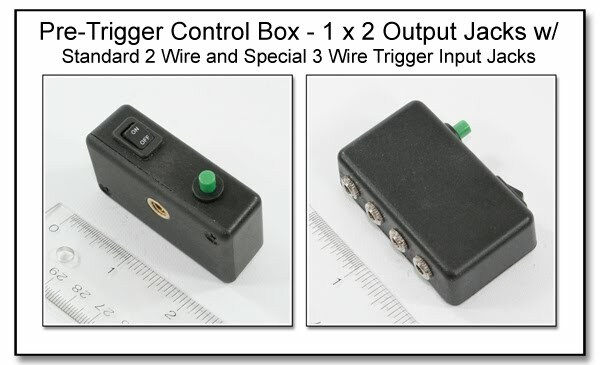 Here is another example of the Pre-Trigger Control Box (1x4), but this time the output jacks are on the side face, with the input jack on the main face along with the Override switch. Using a RA (right angle) plug for the input, and straight plugs for the outputs will allow all the cords to exit the unit in a neat and orderly fashion. The rear face has threaded inserts for both 3/8-16 and 1/4-20 standard thread sizes for mounting the control box to a threaded stud. 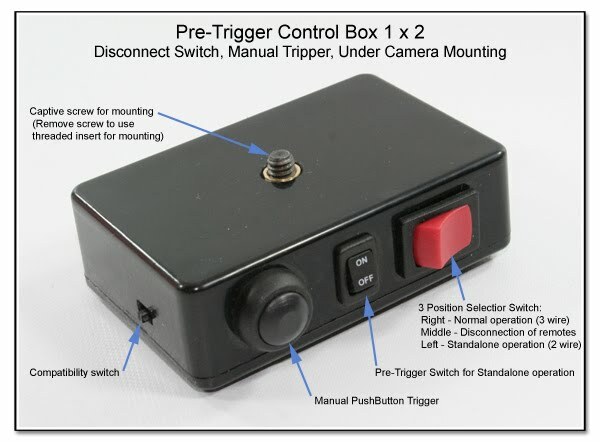 This Pre-Trigger Control Box (1x4) - Side Controls, has all the controls and connections on the side face for a very clean, unobtrusive look. There is a single 2 wire input, but a 3 wire input can be added if desired (see below). In this format, the entire Control Box can be put in a waterproof bag, and then all the cables will exit in a single bundle. The costs are still the same as listed in the 1x6 Pre-Trigger Cable (Hardwired). in this example, the basic box with a single output is $185, and then each additional output is $55. The Test Switch (Manual Push Button), adds $45, and the threaded insert adds $45, for a total of $185 + $55 + $55 + $55 + $45 + $45 = $440 . As should be obvious by now, just about any configuration and set of optional components is possible, just ask and describe your intended setup. Crushproof Cable) which is $140 for up to a 4 foot cable. Cables used to connect the box outputs to individual camera pre-trigger cables are available in various lengths. As an example, a 25 foot 3 conductor cable with molded plugs is $25. Either 2 wire or 3 wire Pre-Trigger Cables can be used, but the 3 wire cables will allow the Override Swtich in the Pre-Trigger Control Box to function properly, and control the Pre-Trigger function of the remote camera. 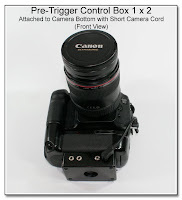 Here is an image of about the smallest 1 x 2 Pre-Trigger Control Box, and is made to mount either above or below a bracket, and be close to one of the 2 cameras this is meant to control. You can see that the box has dimensions of only 2 x 1 x 3/4 inches, has a manual push button trigger, and dual input jacks. One input jack is meant for the standard 2 wire momentary switch (Foot Switch, Lens Mounted Trigger, or Pocket Wizard), and the other input jack is meant for a special 3 Wire Dual Position Switch, just like the regular camera shutter that will do a half press to focus, and then a full press to actuate the trigger. This half and full press action can be done in a single switch as in the Custom Stick-On - Half & Full Press Trigger, or in 2 single action switches set next to each other as in the Stick-On Trigger - Dual Switch, as long as each trigger ends in a single 3 conductor mini plug. 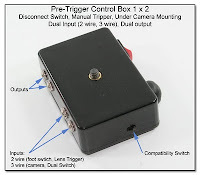 Making this ultra-small Pre-Trigger Control Box does cost a bit more than the larger units above because of the ultra-small size, and is $475 for the unit as shown with the dual outputs, dual inputs, manual tripper, pre-trigger override switch, and threaded insert for mounting. 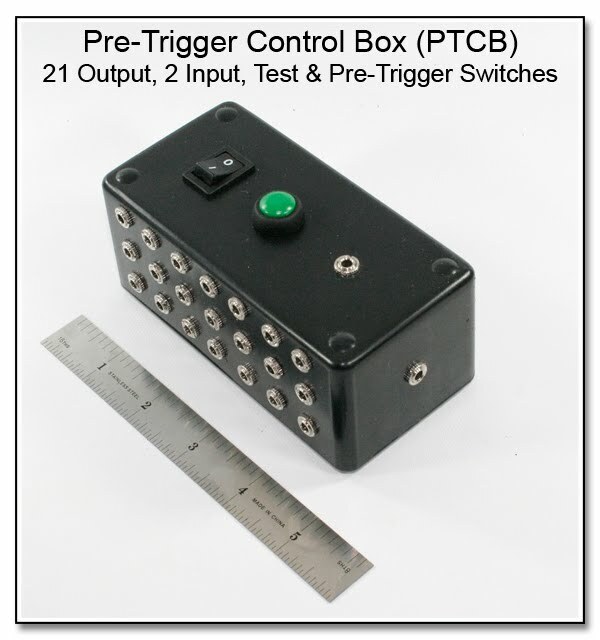 As an added benefit, all of these Pre-Trigger Control Boxes can also be used in Hardwired Trigger Mode, which is especially useful in very crowded shooting environments where the interference between competing radios is a real issue. 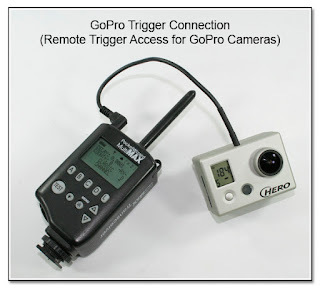 The remote cameras will be very closely in sync with the trigger camera with hardly any need for sync equalization. 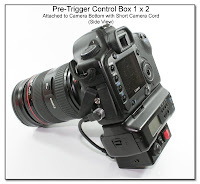 To do this, the Control Box must be connected to the main camera, not using the PC jack or hot shoe, but by using an Open Circuit Pre-Trigger Cable (Pre-Trigger Cable with the override switch set to "OFF"). Normally, the input jack of the Pre-Trigger Control Box is wired as a 2 conductor jack for a single stage of a switch closure, like a Foot Switch, Lens Trigger, a radio receiver, or the connection directly to a camera as mentioned in the paragraph just above. An additional input jack that is wired as a 3 conductor jack can be added to any of these Pre-Trigger Control Boxes to allow for a 2 stage input trigger that will then signal the Half Press, and then the Full Press, just like the actual camera shutter. In this fashion, you can correctly use any wired shutter release ending in a 3 conductor mini plug, like the Custom Stick-On - Half & Full Press Trigger, or the Stick-On Trigger - Dual Switch. It is $75 to add the extra 3 conductor mini jack to any of the above Pre-Trigger Control Boxes (that don't already show this extra feature) as a way to provide for an alternate 2 stage input device. All of the Isolated Outputs on these Pre-Trigger Control Boxes are 3 wire setups so that both the half press, and full press shutter actions can be passed through to the remote camera (as long as the input signal passes both half and full press). This also means that you can use a Pre-Trigger Cable that ending in a 3 conductor mini plug (no switch), or a Pre-Trigger Cable ending in the 2 conductor mini plug (with switch). The Pre-Trigger Cable ending in the 2 conductor mini plug, but without the switch can be wired as Pre-Trigger ON or Pre-Trigger OFF, and is sometimes referred to by the older name of "Motor Drive Cable". If you use a Pre-Trigger Cable having the 3 conductor mini plug (no switch), then the Override Switch that is often added to the Pre-Trigger Control Box will be able to manually set the Pre-Trigger to ON or OFF. If you are using the PW MultiMax or PW III to remotely set the Pre-Trigger status, then the Override Switch should remain in the OFF position during use (the ON position would be for setup and testing). 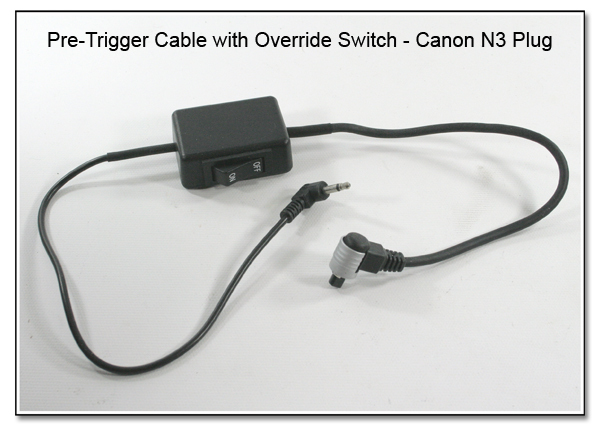 If you are using a Pre-Trigger Cable that already has a built in Override Switch (and ends in the 2 conductor mini plug), then only the Override Switch built into the Pre-Trigger Cable will have any effect on the Pre-Trigger status of the remote camera. 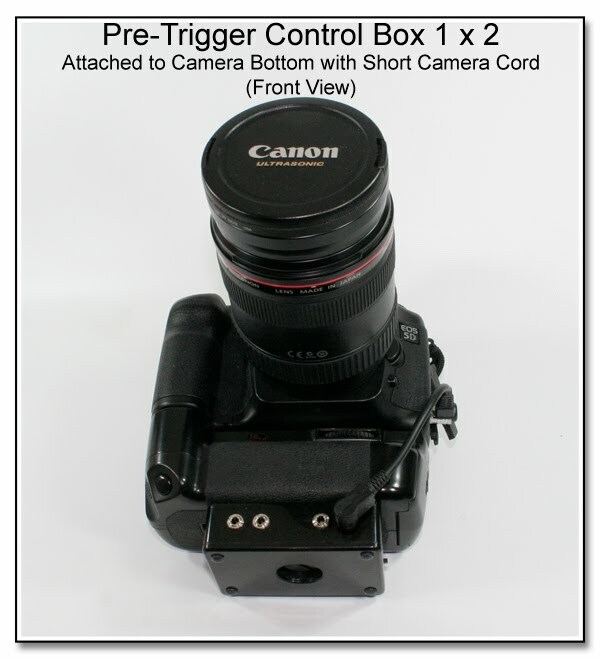 This Pre-Trigger Control Box has some new features, such as an easy under camera mounting using the removable captive thumbscrew. By removing the captive screw, the Conrol Box can also be mounted to a bracket unthreaded hole using the threaded insert of the Control Box. In addition, the Main Selector Switch (shown in red) has 3 positions, and is designed to disconnect the Outputs from the Inputs, and provide a complete isolation between the Main and Remote cameras. One reason for this disconnect is for when the Manual PushButton Trigger is pressed, only the remote cameras will fire and not the main camera. In the same Disconnect position, firing the main camera will not allow the remote cameras to fire, without having to disconnect any cables or plugs. With certain camera combinations, opening the memory card door sends a feedback signal to the remote cameras and they will fire continuously for a time. By providing this isolation through the Disconnect Switch, the memory card of the main camera can be replaced as often as needed without the extraneous firing of the remote cameras. New USB Pocket Wizard), and is connected to the 3 Wire Input Jack. Even though there are 2 Output Jacks on this Control Box, it is "cleaner" to use just a single connecting cable when this unit is mounted under the camera. If multiple remotes are being used, the connecting cable can then be used as the input to another Pre-Trigger Control Box will will handle the actual splitting and isolating of all the separate lines to the individual remote cameras. New USB Pocket Wizard). The Canon cable shown here with the metal lock collar would be $100. 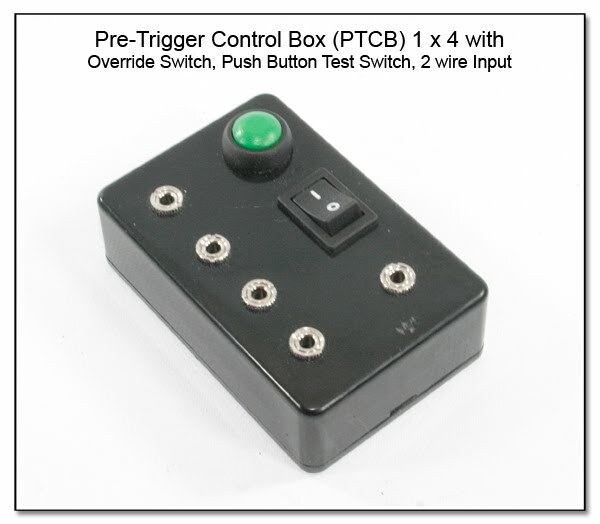 This Pre-Trigger Control Box has 3 Isolated Inputs as well as 3 Isolated Outputs, but no Momentary Test Button, or Pre-Trigger Override Switch for a sealed and clean look that is less likely to have curious hands switching any of the controls. Notice that there is a mounting foot on the bottom, as this unit would usually be placed and even mounted to the remote camera. Having 3 Isolated Inputs allows firing the remote camera(s) attached to the Isolated Outputs from any of 3 different locations or methods. As an example, the remote camera can be positioned to cover home plate action (baseball), while handheld cameras located at first and third bases can be hardwired (see PT1031 below) and connected to two of the three Isolated Inputs. The third Isolated Input can then also be used to connect either another hardwired camera or a radio receiver for further walk around operations. For ultra reliable remote camera operations in an electronics heavy environment (every field and stadium today), a hardwired solution sometimes becomes the only option. 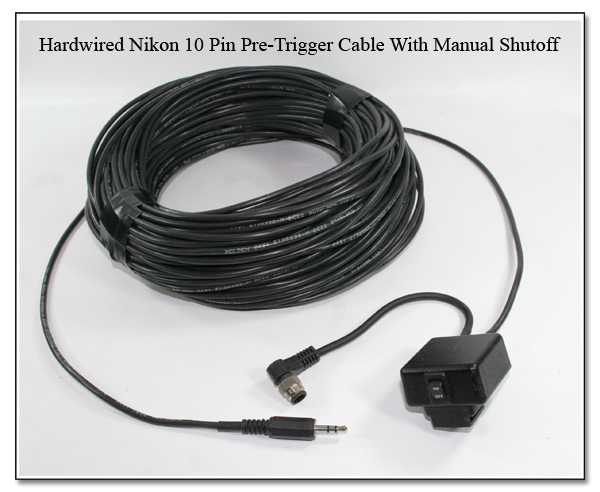 Shown here is a Nikon Hardwired Trigger Cable (150 feet), where there is also a small Remote Camera Disconnect Switch that can be mounted in the camera hot shoe. 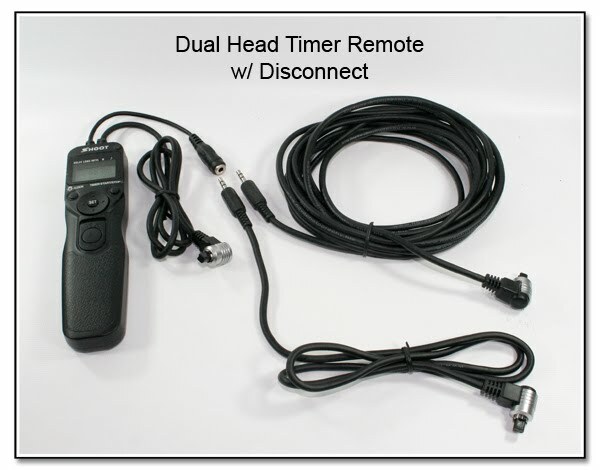 The Remote Camera Disconnect Switch will prevent the remote camera from firing when the handheld camera fires, without having to disconnect the cable from the handheld camera. Not included in this version, but always an option, is to include the provision to fire the remote camera without firing the handheld camera. This can be done using an installed pushbutton switch, or a connection into the box for any other momentary switch, like the Foot Switch, Lens Mounted Trigger Switch, or the Stick-On Trigger Switch. Many of these other items can be seen in the Lens Mounted & Other Triggers section. This 21 Output PTCB works like all the other Pre-Trigger Control Boxes in this section, in that each output is electrically isolated from the next, and all 21 outpus can be triggered at the same time either by pressing the green push putton, or momentarily closing any type of switch that is attached to 1 of the 2 input jacks (top or side face). The cost for this version is similar to the other boxes of this type. It is $185 for the basic setup, $55 for each output, $45 for the Push Button, and $75 for the second input jack. While the input jacks are usually set up for just a 2 wire single position switch, either one can be wired for a 2 position (3 wire) switch so you will get both half press and full press actions from the remote switch or radio trigger that supports these functions. The new Leica S2 medium format camera didn't have a trigger cable until now. 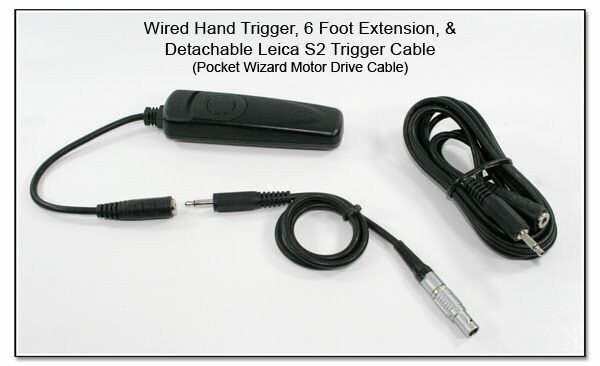 This Leica S2 Trigger Cable is shown working with a very nice wireless (RF based) remote that is made under many names. Shown is a coiled rubber cable, although a straight cable can be used as well, and custom lengths are always available. While this particular Transmitter (Interfit Strobies Delta) will transmit both a half press and a full press to the matched Receiver unit, currently the Leica S2 will only accept the full press signal. Further analysis will be done soon to reveal if the Leica S2 will actually support the half press signal through the remote release input port, as most other digital camera already do. Update: I have analyzed one of the S2 cameras, and sorry to say, the half-press of the shutter is not available through the remote connection port. This doesn't really matter for most shooting with most remotes, although remotes like this Interfit Strobies (and the other clones) are able to transmit the half shutter press. This trigger line will be expanded shortly to most every type and size of wireless device (Pocket Wizard, Elinchrome, CyberSync, etc). Just about all of these wireless (RF based) triggers will only transmit a single signal, unlike the wireless trigger above, and just as with other Pre-Trigger type of cables, the cable itself can be wired as if the Pre-Triggger is set to ON or OFF, based on the particular setup desired. The base price to make a Leica S2 Trigger Cable is $150 using a straight cable ($10 additional for the S camera), or a cable that you send me that came with the trigger set you already have. Coiled cords (up to 6 foot extended length) are available for $55 additional. Right angle (RA) sub-mini plugs are also available at $5. You can extend the length of any of these cables using M-F extensions matched to the size of the plug on the Leica S2 Trigger Cable. 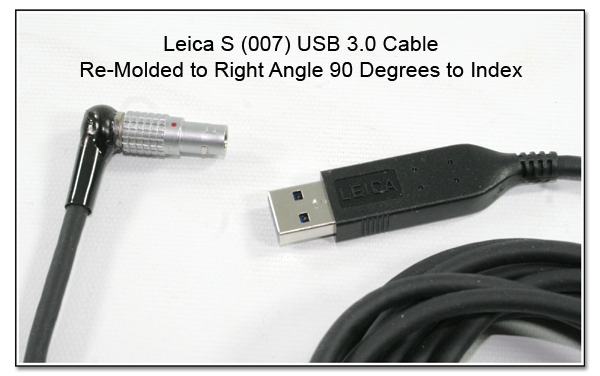 Update 8-9-13: The Leica S uses a different plug (looks the same, but different number of pins, and a different keyway) for the trigger cable than the Leica S2, but currently the pricing will be just $10 additional as listed above, with all the same options for extensions. This image shows the Leica S plug (blue strain relief) next to a Profoto Air Remote, although Pocket Wizards, and most other wireless remotes can also be used. It is $150 to make an S2 Trigger Cable ($10 additional for the S camera). Right angle (RA) plugs (mini shown in image) are also available at $5 additional. Update 7-22-15: The PhaseOne cameras (iXA, iXR), use a different plug (looks the same, but different number of pins) for the trigger cable than the Leica S and S2, but currently the pricing will be just $10 additional as listed above, with all the same options for extensions. Update 9-18-15: The Nero Trigger uses the 3 conductor 2.5 mm plug, and this pricing will be just $10 additional as listed above, with all the same options for extensions. This Wired Hand Trigger has been re-configured to allow the Leica S2 Trigger Cable (just above) to fit, and even be extended using any number and length of M-F cables. The Wired Hand Trigger is available in many forms, ranging from the OEM versions like the Nikon MC-DC2, Canon RC-80N3, Nikon MC-30, or any of the generic versions of these same Shutter Release units. It is $105 to add this sub-mini jack to a generic Shutter Release while it is $95 to add this sub-mini (2.5 mm) or mini (3.5 mm) jack to any Shutter Release you send to me (timer version or standard). The LEMO connector to mini plug end is naturally additional ($150), unless you send it along. The 6 foot M-F extension shown is $35, while a 12 foot M-F extension is also availble for $55. Here the disconnect is made using the mini plug and mini jack. 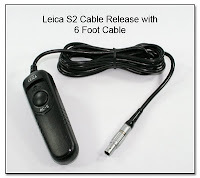 The S2 cable can be unplugged and used to connect to a Pocket Wizard or other radio receiver using the mini (3.5 mm) sized connector, or left connected to be used as a handheld wired trigger. The costs are just as above with the sub-mini connector setup. 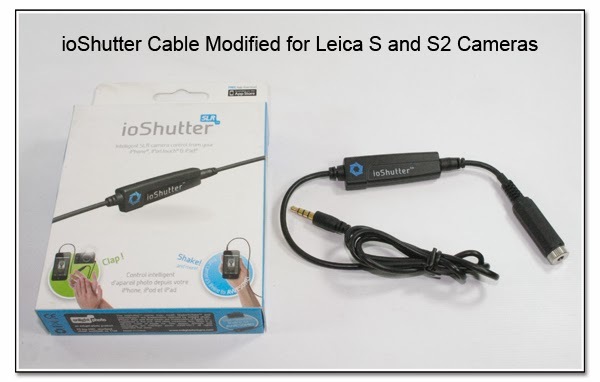 As you can see, the inline mini jack (3.5mm) can be added to almost any device, such as this ioShutter cable for just $105, to allow the Leica S2 and S Trigger Cable to be used when connected to the iPhone using the ioShutter intervalomter app (for iPhone and iPad). 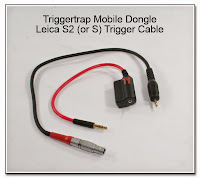 For those using the Android platform, the TriggerTrap mobile app, and cable can be modified for the Leica S2, and S cameras for the same price as above. Please keep in mind, that the wiring for the S and S2 is different than most other DSLRs, so make sure to specify which camera this setup will be used with. 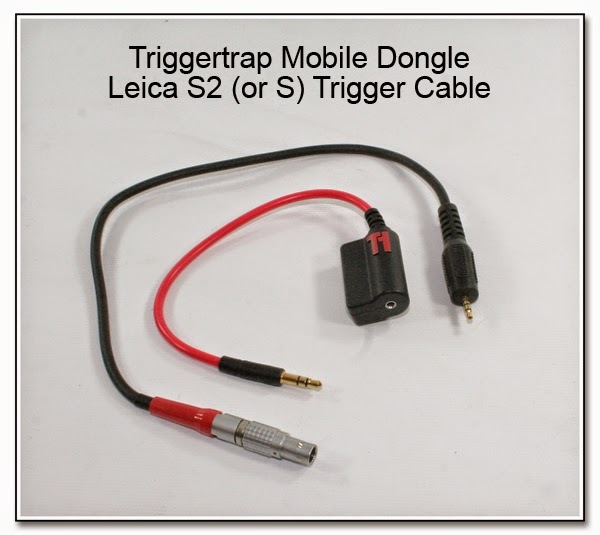 Here the Leica S2 (or S) custom trigger cable has been made to fit the Triggertrap Mobile dongle. This cable is made using the appropriate LEMO connector for the S2 (or the S), and ends in the sub-mini plug. It is $150 to make an S2 Trigger Cable ($10 additional for the S camera). Right angle (RA) plugs are available for $5. 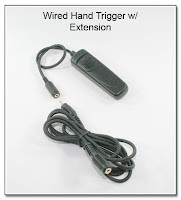 If the original length of cable is too short on the wired hand controller, it can be extended using the disconnects and extensions as above, or a longer length of cable can be directly added between the LEMO connector and the hand controller itself. It is $75 (plus S/H) to re-solder and re-anchor the existing cable into the existing LEMO connector, providing the existing LEMO connector is still usable. If any parts of the LEMO connector are missing or damaged, then an entirely new connector is needed also. A very popular $100 option is to put a mini plug / mini jack disconnect into the line (seen just above), so the cable section can be used as a trigger cable with any Pocket Wizard or other mini jack sized radio trigger. Extensions are also available for making a longer trigger cable. Should the radio set use the sub-mini size, then you would naturally request the sub-mini disconnect set. The top image show a RA (right angle) LEMO shell that can be used for any of the needed Leica connections. Unfortunately, the standard LEMO RA shell is more costly than the inline version, and is not always available. In addition, the cable exit is always at 180 degrees from the index mark which is always at the 12 o'clock position on the Leica camera body. Sometimes the cable shell can be modified by removing the cable clamp, and re-molding the strain relief to allow the cable exit to be at any position needed. This re-molding and modifying of an existing LEMO shell will add $195 to the cost. 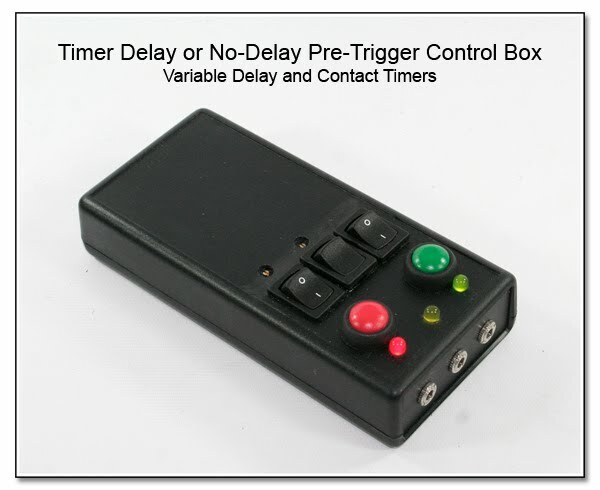 While this item PT1029 is technically a Pre-Trigger Control Box, it is another Custom item that has a specific purpose: to insert a variable time delay (or no delay), and a variable contact time for triggering a single camera from a given trigger event. It can also be used in a dual camera setup to aid in syncing the 2 cameras, although it will naturally not be as accurate as the true Digital Delay Module (CP1100, below). 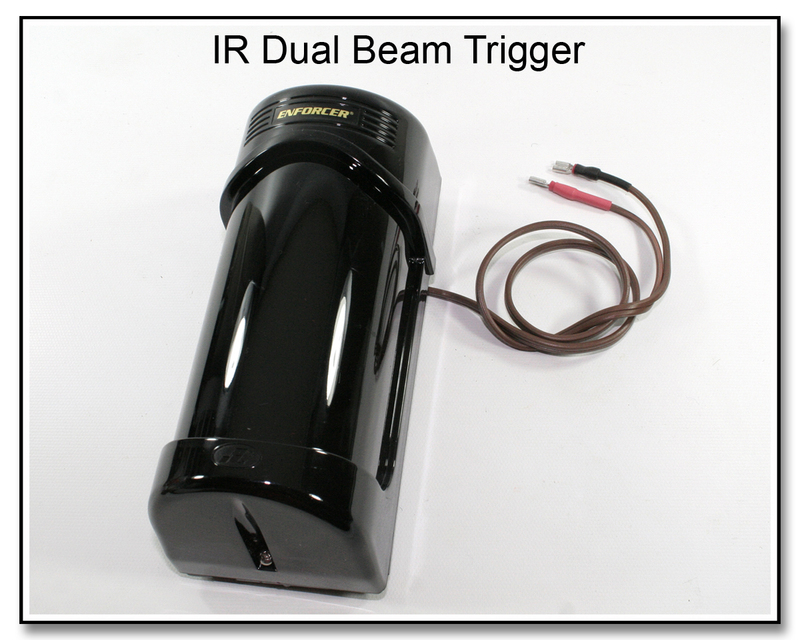 This setup was made to use the Dual IR Beam (shown left) as a "Break Beam" trigger for horse jumping events, but many other finish line uses should be obvious for both the Control Box as well as the Dual IR Beam Trigger Unit. 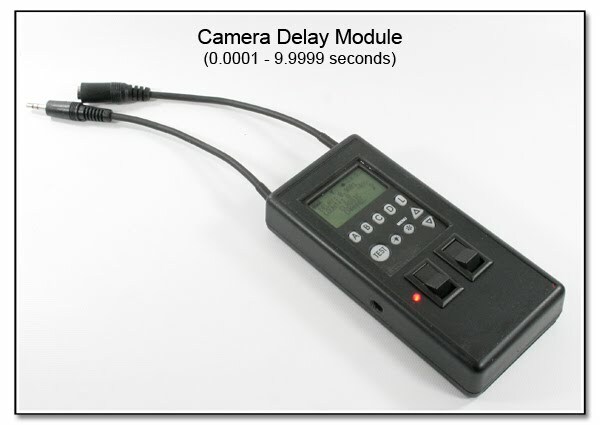 This Camera Delay Module is made to be inserted in a camera line in a Dual Head Camera Setup as a way of inserting a delay for firing the attached camera. Besides the Power ON Switch, there is a Pre-Trigger Override Switch, and the controls to set the actual delay time. The timed delay can be bypassed with or without actually removing the unit from the system by either powering the unit to OFF, or activatiing the Power ON Bypass Switch. 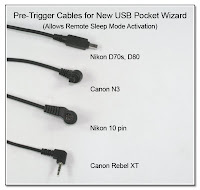 The Pre-Trigger cord will keep your camera AWAKE and ready to fire when switch is ON...(as in holding shutter partway when focusing) Quality soldered connections, tested and guaranteed to work! Override switch turns OFF the pre-trigger action, saves battery power, and allows a preview of your image / settings without unplugging the cable. To view your image or change settings, you must turn OFF the override switch, which turns OFF the pre-focus mode. Your camera does need to be set so it can shoot in a continuous mode where as long as you are holding the shutter button, the camera will fire a picture. There is a further explanation of the difference between the "Motor Drive" and the "Pre-Trigger" Cables in the FAQ section. Custom configuratons? Just ask... I have made all different types!